I’ve lived in Holland about 10 years and currently have a child attending Holland Elementary School. For app. 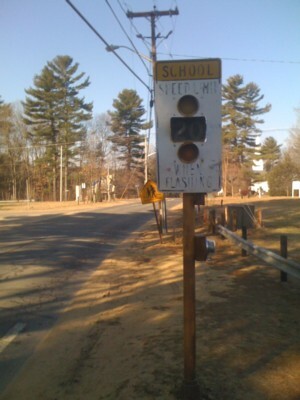 8 years the blinking light driving eastbound on Sturbridge Road near the school has not been working. This is a safety hazard for school children crossing the street nearby. Moreover, the lettering on the sign(s) is almost impossible to read. This is a lawsuit waiting to happen - especially if you, Mr. Blogger, forward my note to the “powers that be” in town and still nothing is done. I notice that Mr. Selectman Johnson claims to be concerned with safety issues. I find this hard to believe, for it appears that there are other unrelated road issues that are getting attended to, but this sign (a mis-reading of which could cause the serious injury to or death of a child and a lawsuit against the town) should have been fixed years ago. Mr Blogger, could you see what you can do? As a newspaper reader I’m confused. It is obvious that the Johnson’s (Earl the selectman and Brian the head of the Highway Dept.) love their own kids and hopefully they care about kids of other families of our community the same way. Having said that I don’t understand why this broken safety lights never get fixed. I can see that these lights increase the safety of our kids and also the safety of the bus drivers pulling in and out off the parking lot of HES if they would work. Throughout the nation these lights are in place and are in working condition. Another given is that Earl Johnson one of our elected and trusted selectman would not lie to us. Here is my predicament, how can my believes be true as it seems to me that Earl Johnson cares about the safety of Peter Frei and James Lamountain and not the safety of our children attending HES? Selectman Earl Johnson and the rest of the selectboard was willing to spend more than $100,000 for the safety of Mr. Frei (and failed) but does not see the need to fix these safety lights? Earl Johnson also mentioned safety reasons for installing the safety posts or concrete posts in front of Mr. Lamountain’s lakefront property south of PJ’s along Mashapaug Road so no cars would drive into the lake. We taxpayers funded the purchase of the expensive heavy equipment that was used to plant the safety posts on Mashapaug Road, why can’t the Highway Dept. use the same equipment to dig a trench and replace the allegedly broken underground wires to fix the safety lights? This web-blog has been an eye opener for me and my family. Well it's been over a month since this broken light has been reported. I was wondering if it's been fixed yet or does the highway department just not care? Will it ever be fixed? Brian, why don't you put our fancy machinery we the taxpayer paid for to use for a change? I have complained about this light several times and have been told over and over again it will be fixed. Our elected officials seem to care more about building truck stops and housing for their friends then they do about our school childrens safety. I learned from one of my neighbors that the broken safety light driving westbound on Sturbridge Road in front of HES has not been working for 12 years. This is simply unacceptable! As taxpayer I just don’t understand why this safety light is not a priority. I see the diligence of selectman Wettlaufer in other matters (hillside property owned by Northeast Concepts), and find it outrageous that one more year went by without attending to this safety issue. The broken safety light is the one west of HES warning drivers driving eastbound and not westbound. The lettering on both signs is almost impossible to read, see picture above! We finally got a new safety light, it is even solar powered! I'm talking about the safety light in front of Holland Elementary School, the one on the side driving towards the dam. Thanks! Now the other safety light, the one driving towards the four corners, does not work any longer?!?! What a joke the Holland government is.... Glad to be living in another town! I'm glad I moved too. I loved holland very much while I lived there for 20 years right up until the moment I had to deal with the "town" hall. I bought that property when I was 23 to raise my future family on. I really did look forward to raising my kids on the lake just as I was brought up.